BEWARE! Even horticulture has a dark side. Amy Stewart and Briony Morrow-Cribbs offer up 40 menacing plants in gorgeous, vintage-style botanical illustrations to color. Drawing on history, medicine, science, and legend, each wonderfully creepy spread offers the curious stories of these botanical evildoers, from the vine that ate the South to the weed that killed Lincoln’s mother to the world’s deadliest seed. For gardening die-hards, each plant’s family, habitat, and common names are also listed. 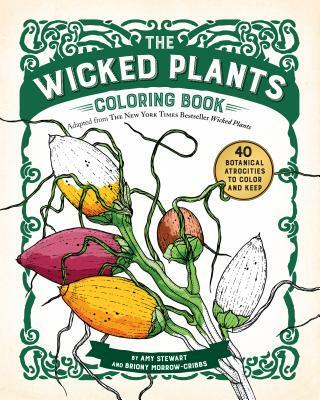 Based on the New York Times bestseller Wicked Plants. Briony Morrow-Cribbs studied studied art at the Emily Carr Institute of Art and Design in Vancouver, British Columbia, and currently lives in Brattleboro, Vermont, where she owns and operates Twin Vixen Press.